From time to time, we chance upon a bladdy loser news that tickled our funny bone. Remember the last time when we had the misadventure of a Spiderman who got himself stuck at the top of a billboard and needed the fire department to rescue him? Well, today, I found another Failure Ah Pek news on the South China Morning Post dated 18 Jun 2006. Talking about a toothless tiger! This one really damn seet pai. 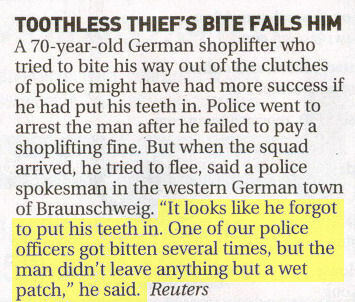 lancerlord: If this guy can afford titanium dental implants, then no need to shoplift right? lancerlord: Oh yah hor! LOL! Anna: Aiyoh, pre-teething puppy?? That's very young liao! !